BMO Harris Bank’s Marco Quintana is one of those athletes that never outgrew the court. He likes to speak of business in terms of teamwork and hard work and working toward a common goal. You don’t have to be the boss to be the leader. Marco Quintana graduated from Morton High School in 1999, but he returns every year to deliver that very message to its students. First as a collegiate volleyball champion and again as a corporate banker for BMO Harris Bank N.A., Quintana learned the truth behind those words that provide a simple, yet powerful, rule to work by. Quintana is one of those athletes that never outgrew the court. When he speaks of business, it’s in terms of teamwork and hard work and working toward a common goal. As a financial advisor, he is like a coach to his clients. If Quintana’s greatest athletic achievements were commemorated with a peewee trophy, he might seem like a sports junkie or just a big kid. But for Quintana, his athletic career was more than just a game. Before moving to the United States at 13, Quintana and his family spent his childhood in Guatemala. Growing up at the end of the country’s nearly 40-year civil war, Quintana holds memories of military coups and political unrest. His parents decided to make the move for safety, but found danger can live anywhere, even in Pilsen, the neighborhood of Chicago where they settled after a short time in Southern California. his neighborhood became his ticket to higher education. Earning a scholarship to Lewis University, Quintana began his college career as an education major. He quickly changed his mind after taking his first finance class, but has never completely shaken the teaching tick. After spending some time as a teller after graduation, he got connected with Martin Flood, an employer and mentor who introduced Quintana to the investment industry, commercial lending, and branch management—and gave him the opportunity to put his passion for his community and education to good use. Knowing you have done everything you possibly can to become the best person or human being you can become with your abilities. This is in relation to life, family, work, athletics, and/or as a student. It is knowing you did your very best. You didn’t leave anything on the table—didn’t cut any corners. Like a coach, an advisor is a trusted individual in whom you have trust and confidence that he/she will give sound recommendations and make the right decisions to help you achieve your success. As an advisor, I listen and focus on the needs of the client. I see their goals and as a team we put a strategy together to achieve them. I may not be playing across the net as I did in volleyball, but I am playing across different obstacles in the business world. 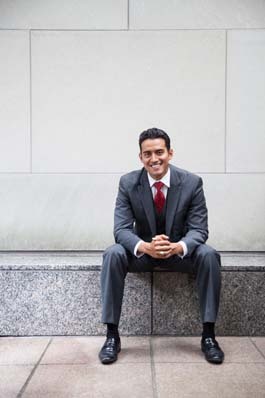 At BMO Harris, where Quintana landed as vice president of commercial banking after excelling with the same clientele at his previous institution, he continues to place education at the forefront of his work, in and out of the office. Since 2004, he’s been focusing on the new market tax credit program and continues to do so for BMO Harris Bank, a unique financing alternative that simultaneously helps low- to moderate-income geographies as well as commercial clients. The deal is structured such that new market tax credit investor makes an equity investment of up to 20 percent of an expansion project, BMO Harris provides a leverage loan for the majority of the project, and the difference is funded by the client’s true equity. The new market tax credit investor gets a 39 percent tax credit over a seven-year period. The benefit for the client, says Quintana, is that the company receives up to a 20 percent subsidy into their expansion project, and this capital is classified as “forgivable debt” after the seven-year compliance period.